The first step for manufacturing decorative laminate sheet is to prepare resin. There are two types of Resin , one is Phenolic Resin made out of mainly Phenol & Formaldehyde which is used for impregnating Kraft and other is Melamine Resin made from Melamine & formaldehyde which is used for impregnation of Base Paper/Print, overlay Tissue. After impregnating base paper/print, overlay tissue , these are stored in A/c room under specific climatic condition. 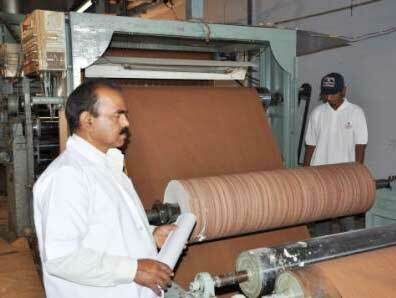 Impregnating kraft, base paper & tissue are taken in assembly area for making assembly by taking numbers of layers of impregated kraft depends on thickness require and above it impregnated design paper is taken. These assemblies is kept below the caul plate . The surface of the laminate is dependent on the use of caul plates which may be of stainless steel or plates with chromium or nickel. The surface of the caul plate may range from high gloss, matt or sued . In a multi platen Hydraulic press, number of such assemblies are kept. The platens are bored from inside & fabricated in such a way that steam & water can pass through it, effecting heating & cooling of the laminate sheets. The two assemblies are separated by keeping BOPP Film in between them. After completing the curing cycle sheets are taken out from hydraulic press and released from the caul plates. These sheets are later trimmed for 4 sides by using circular saw and its back side is roughned by using sanding machine. After this, sheets are taken for inspection & gradation. Marking/Labelling is done to identify finish and design number. To protect the surface of the laminate sheet wrapping is done by using wrapping machine. After this, laminate sheet are stored in specific racks and in this way material is ready for dispatch.